I went to the BRA meeting last night for the proposed project at 17-23 Greylock Road. Dmitry Baskin is the developer who lives in Newton and owns 19 & 21 Greylock. #19 is a 3-family appraised at $720,480 and #21 is a 2-family appraised at $669,370. Baskin wants to demolish these homes and build a 20 unit apartment building primarily of 1,000 sq ft 2BR units. 1) The BRA website for this project has only a 1 sentence description of the development. No maps, no drawings, just 1 sentence. We were told that this is because the developer hasn't given the BRA an electronic version of its proposal. If this was 1999 that might be understandable, but in 2009 I can't understand why the BRA doesn't require developers to submit a PDF file of their proposal. And even if the BRA only has a paper copy, they should use a scanner to make a PDF and get it on their website several days before a meeting. 2) The BRA's public outreach for these meetings could be a lot better. A lot more could be done than an advertisement in the TAB and and email to some list of residents that the BRA keeps. Sending emails is great, and if you go to http://www.bostonredevelopmentauthority.org/ or http://www.cityofboston.gov/ it should be much more obvious how to get emails for events and meetings in your neighborhood. For example, the My Neighborhood page could include a sign-up box to subscribe to this list. City Hall sends postal mail announcements of various things (Zoning Board of Appeal hearings, Historic Commission hearings, real estate tax bills). If a developer wants a zoning variances for a new development and the BRA actually wants community input, the BRA should mail announcements to direct abutters and nearby property owners. Or the BRA could do like many community volunteers, political candidates, and local restaurants and have someone spend an hour going door to door putting flyers in mailboxes. They could even go so far as to staple some notices to telephone poles like Harvard has done for the Farmers Market. Many neighbors have been touting the benefits of an economically diverse community instead of the segregated Charlesview that Harvard, Charlesview, and the BRA. They want to shelter the rich in a tower overlooking the Charles and isolated the poor in apartments next to the Star Market parking lot. We think people from all walks of life can and should live together harmoniously. "achieved a delicate economic mix that is rare anyplace, much less in an enclave of oceanfront property. Sure, there’s a smattering of doctors and lawyers (and the odd journalist), but some of my favorite people on the Neck include a prison guard, a locksmith, a retired nurse with seven children, and a generous, savvy guy who installs coin-operated Laundromats." If it can work on a North Shore peninsula, can't it work in Brighton? 20 Fanueil Street - Change the legal occupancy fro a one-family dwelling to a two-family dwelling. Erect an addition. Neighbors who have thought that the Lincoln Street Green Strip has been looking a bit too wild will be happy to see that it got a major haircut yesterday. Today's papers show the BRA and The Community Builders denying and obscuring the reality of the segregated housing that they want to build in the new Charlesview. Felicia Jacques's misleading statistic that the "median income for a family of four at Charlesview is $45,100" lumps together the market-rate Telford St condo tower and the low-income Brighton Mills apartments. How about a proposal where Telford St and Brighton Mills each have approximately the same median income, with a range of housing for all people at both sites? Can we get housing at Brighton Mills like what The Community Builders wrote about in their report "Resident Success in Economically Integrated, Socially Diverse Housing"? "public housing residents, working poor families, and market rate renters and owners, of different races, will live side by side in a high quality housing development, with first-rate program supports, culturally sensitive staff, and broadly appealing community activities"
For some unknown reason, The Community Builders thinks that kind of integration is great for other neighborhoods but not ours. I don't know who Kairos Shen has heard using the phrase "low-income enclave", but as they say, if it looks like a duck, swims like a duck and quacks like a duck, then it probably is a duck. The yellow highlighting shows the low-income housing on the Brighton Mills site. To make clear, my neighbors and I are not opposed to the relocation of Charlesview. We will gladly support a new Charlesview as part of a modern mixed-income neighborhood consistent with today's best ideas of housing development. Segregating people by income level, repeating the discredited ideas of the 20th century, is not the way to go. “There are still not enough homeownership opportunities and they’re not mixed throughout the development,” said Sal Pinchera, a member of an eight-member panel that advises City Hall on the project. Paul Berkeley, president of the Allston Civic Association, said while the revised project is an improvement, he’s not sure the plan will win over critics.“It definitely has improved, but is it enough to turn public opinion?” he said. “We’ve asked the builder to build a truly diverse mixed-income community, and not just put 260 apartments in one big mass,’’ said Harry Mattison, an Allston resident who opposes the current plan. This morning, the white "helper" crane lowered the boom from a tower crane at Harvard's Science Complex construction site, leaving only one functioning crane where last month there were four. I'm not sure what it is, but you can see Allston's newest street art, which appeared over the weekend, at the Cambridge Metals building, 510 Lincoln Street near the intersection with Cambridge St.
Too bicycle-friendly to be true? First, North Harvard St north of Western Ave gets repaved and bike lanes. I haven't seen the bike lanes yet, but the new paving is really nice! Now the TAB reports that Harvard Ave is going to get bike lanes this summer. Wow! Does this seem out of order to anyone else? Wouldn't the City have the greatest negotiating leverage before, not after, approving BC's expansion? But this is no fluke. The City also approved Harvard's billion-dollar science complex before negotiating the Payments in Lieu of Taxes that Harvard would pay. Because BC wants to convert the 188 condos at 2000 Comm Ave into a dorm, the Mayor is asking BC for an additional $411,000 a year in PILOT. Tower crane #4 will be dismantled using an assist crane. Multiple sclerosis expert Dr. David Halfer is leaving Harvard, and part of his reasoning seems be based on how Harvard is contracting, or at least not expandning into Allston and elsewhere. "[Yale's] ability to provide me with just spectacular resources to do that, to recruit young faculty and to build up that program at a time when things are not expanding in Boston, is a real opportunity for me." Fact: "The universities are now poor"
There isn't much new in this story, but some of the quotes and facts are interesting and further make the point that it is likely to be a long, long time before Harvard builds anything new in Allston or even contemplates anything like what it had been planning for the past several years. Yale, whose endowment was approx. $16B in June 2009, estimates that it will take more than 10 years for it to grow back to its June 2008 value of $23B. Allston and Brighton residents have been surprised by how little housing and other new development the BRA is proposing for the 30 acre Holton Street Corridor which is so badly in need of major redevelopment. The BRA's 10-15 year plan for includes between 296 and 191 new units of housing (509 t0 404 total units, minus the 213 units that replace the existing Charlesview, according to slide 30 in the June 29 presentation). The BRA and Harvard's rationale has been that the economy is the limiting factor, but it is hard to believe that it is possible to sell/rent only new 13 units each year, especially if investments are made to build new parks, a new commuter rail stop, and other public realm improvements that should accompany this new development. In my opinion, it seems more likely that Harvard's desire to continue land-banking is the more likely motivation for the BRA's proposing so little development in the near future. To debunk the theory that the economy is too dismal to contemplate anything more, Governor Patrick, Senator Kerry, and Congressman Capuano went to Somerville today to announce a 65 millon dollar state-federal partnership to move forward with the 66-acre Assembly Square Project, a project much greater than anything that could ever be imagined for A/B North. "A large, multi-phase project to be completed over several years, the Assembly Square project will ultimately result in 1.75 million square feet of office space, 1.15 million square feet of retail space including a new hotel, 2,100 rental and ownership condominium housing units and a new MBTA Orange line stop"
According to the Globe, this Somerville development is planned to be completed in the next 10-15 years, the same timeframe during which the BRA says no more than 300 units of housing can be built in the Holton Street Corridor. The scale of Assembly Square also makes the 10,000 square feet of retail proposed in the Holton St Corridor (less than 1% of what is planned for Assembly Sq) seem pretty small, doesn't it? Can the economy really be that much better 4 miles away? Linda Wertheimer, host of NPR's Morning Edition, interviews Vanity Fair's Nina Munk, author of Rich Harvard, Poor Harvard. Munk highlights Harvard's building spree as a primary cause of its financial problems - from 2000-2008 Harvard built 6.2 million square feet of new buildings at a cost more than $4 billion (not sure if that includes the partially-built Science Complex). The next workday to continue our landscaping at the Gardner is a week from tomorrow – Saturday, July 25. We will meet from 9am-1pm and have a lot of work to do moving soil and wood chips to build a path and berm and prepare the site for planting. Please join us and bring a wheelbarrow if you have one. 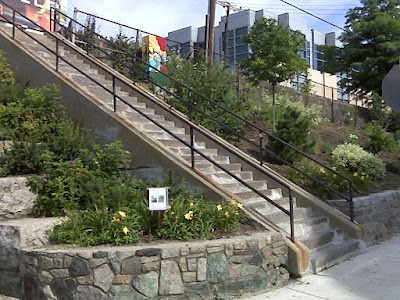 Also, thanks to the dozen neighbors who joined us yesterday evening to pull weeds on the Everett St slope. We took out hundreds of pounds of invasive species and were pleased to find some good plants like Queen Anne’s Lace, clover, and milkweed growing on the site. 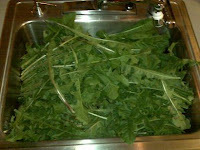 As an added culinary bonus, and some sort of poetic justice, I got to reward my weeding with a lovely dandelion salad last night. Back when we were spending more time talking about the ecological possibilities that could be part of Harvard's expansion into Allston, the Charles River Watershed Association, as part of their Blue Cities work in North Allston, and many others were enthusiastic about the potential to rediscover streams in Allston that once existed but were put in pipes below ground long ago. One crucial connection that should be made explicit as a part of the IMPA is the Allston Creek corridor which successfully provides the critical east-west connection between the residential neighborhood and the Charles River. The current IMPA and IMP Executive Summary not only fail to incorporate the corridor as a part of the overall master plan, but are precluding the option of realizing this connection in the future by not preserving adequate right of way. And this week's TAB reports on the design of Library Park and how, despite that "residents asked for the inclusion of a much-desired water element to the park, either in the form of a fountain or a stream, the current design holds neither." All this came to mind this morning while reading in the NY Times about the success of cities like Seoul as they "rediscover waterways they paved over" and that "cities from Singapore to San Antonio have been resuscitating rivers and turning storm drains into streams". It would be great to have such vision in planning for our future too. "Salvucci thinks the tunnel rehab provides the perfect opportunity to convert Storrow into a genuine parkway (slow moving, narrow, with traffic lights and possibly on-street parking), or maybe even to tear it down altogether." A nice story in the TAB about our project at the Gardner School. Our next work day is July 25 from 9 to 1. Please join us - the more the merrier! 168 Allston Street - Change the legal occupancy from six apartments to seven apartments. 29 Denby Road - Change the legal occupancy from offices services and storage to offices service, storage and adult education center. 39 Pratt Street - The petitioner seeks an Interpretation that the Inspectional Services Department should dismiss the violation of the State Building Code 780 CMR 1181.1 sixth edition. Violation#V000728-2009 for unsafe maintenance: Front stairs are crumbling, smoke detectors are disarmed in various locations; carbon monoxide detectors on first and floor do not work etc. Also, Violations #V000729-2009. Failure to secure a permit to change the occupancy from a two-family dwelling to a lodging house. The many plants that the ABNNF has planted on Everett Street in the past year are looking great, but there are too many volunteer plants that we didn't plant doing too well. We are meeting on Thursday evening at 6:30 between Lincoln & Adamson to pull weeds and do some pruning of what we'd like to remain. It would be great to have you join us. The BRA distributed this spreadsheet at last week's Task Force meeting. It totals the Cooperation Agreement benefits at $25,262,160. Harvard's total benefits as summarized here gives a total of $25,352,160. The difference of $90,000 isn't a ton of money, but it is strange that Harvard and the BRA don't agree on the supposed total value of these items. The status of the Payment In Lieu of Taxes (PILOT) for the Science Complex is another interesting piece of information from the BRA spreadsheet. The Cooperation Agreement signed 15 months ago states that a PILOT agreement would be reached by September 30, 2008. But the July 8, 2009 spreadsheet tells us PILOT "negotiations [are] ongoing". I've written before about how the City under-assesses vacant land, and the Science Complex land is no exception. So even if Harvard is still paying property tax for the former Pepsi parcel which is now part of the Science Complex site, that 2 acre site is worth a lot more than $1.28M and an assessment that accurately represented the fair market value of the land would result in Harvard paying a lot more than $35,000 this year in property tax. Galvin and Alford v. Boston Zoning Commission, Boston Redevelopment Authority, and Boston College Task Force makes for some interesting reading. You can find it at the Files section of the AB2006 website. "Brighton residents sued the City of Boston this week, seeking to halt Boston College’s plan to build ball fields and a dorm on the site of the former headquarters of the Catholic Archdiocese of Boston." After so many years of driving and biking on a god-awful North Harvard Street, it is wonderful that it is finally going to be repaved between Western Ave and the river. The work will be done from July 13-25, so you might want to seek alternate routes during this time. In 2010, as part of a Boston Water and Sewer project, the southern half of North Harvard St (Western Ave to Cambridge St) will also be re-paved. 20 yo, last seen fleeing on foot in Leicester Street area. How does a Smith Field fence improve Barry's Corner? 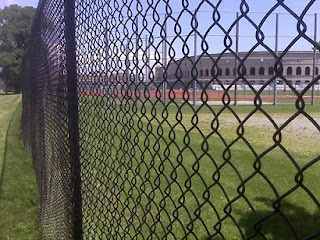 In April 2008 I wrote about a new chainlink fence that was installed between Smith Field and Harvard's Athletic fields. At the time I didn't understand what was wrong with the old fence and why it needed to be replaced, and noted that the new fence limited community access to Harvard's fields which directly contradicts the spirit of the Science Complex Cooperation Agreement. The Applicant [Harvard] shall provide landscaping and streetscape improvements in the Barry's Corner area around the intersection of North Harvard Street and Western Avenue, including the design and the construction of new pathways and landscaped entrances from Western Avenue and from North Harvard Street to the Education Portal, the design and landscaping at the former Citgo station, and the additional streetscape improvements throughout Barry's Corner. The applicant shall obtain Authority [BRA] design approval for said improvements. The Applicant shall expend and estimated $1,600,00 on said Barry's Corner Improvements. Why it is a "community benefit" for Harvard to maintain its own property (the Citgo station) is a question for another time, but I can't understand how anyone with $60,000 to improve our neighborhood would decide that replacing the Smith Field fence was even one of the top 100 projects. The meeting minutes from the Feb 13, 2008 Task Force meeting indicate that "There was a discussion about the streetscape improvements on North Harvard St and further discussion about Barry’s Corner" and promise future meetings about these improvements, but these meetings never happened. A lack of public oversight and transparency has allowed some strange decisions to be made. Now that we have data about what Harvard and the BRA think has been done to fulfill the promises of the Cooperation Agreement, we can begin a real discussion about the proper use of these resources. A quick reminder that we will be doing more planting and planning at the Gardner School on Saturday morning from 10-12. The weather will be uncharacteristically beautiful and it would be great to have your help to make our neighborhood more green. "Boston Mayor Thomas M. Menino guided a tour bus filled with brokers and retailers yesterday, taking them to empty storefronts along Newbury Street and in the Fenway that he said were ripe for new businesses. Menino called on his guests to fill the nearly 20 spaces...Last year, the tour covered Downtown Crossing, Dudley Square, and the South Boston Waterfront." Tough choices at Harvard - One scoop or two? "We can't have chocolate and vanilla and strawberry. 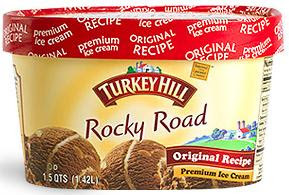 We have to decide which one"
Seems to me that the flavor they are serving in Allston is Rocky Road. She cited her decision earlier this year to save money by pausing construction of a new $1.2 billion science building, the first phase of a planned 50-year expansion into Boston's Allston neighborhood across the Charles River from Cambridge. The university is now reviewing how much — if any — of the project to continue. "It's a very fraught question. It involves the city, it involves the community, it involves constituencies with totally different interests," she said. When the decision is made, she said, "I think that people will feel that we've really thought it through in a considered and responsible way. Moreover, I will know that we will have thought it through." Faust talks a lot about her listening skills, but Harvard doesn't seem to listen when Allston and Brighton residents talk about the most important and timely Harvard topic - the creation of a safe, stable, and economically integrated Charlesview in Brighton Mills. Who tracks promises at the BRA? Today's Herald tells us that the BRA pays more than $280,000 a year to have a staff of 4 track the community benefit compliance of developers in Boston. But 5 years after the deputy director for compliance was hired there is a dearth of information on the BRA's website and requests for information from across the City seem to go unanswered. Go to http://www.bostonredevelopmentauthority.org/ and type "community benefits" into the search box. The results are a bunch of press releases and meeting minutes. The one is a press release from 2001, the 2nd is a press release from 2000, and the 3rd is meeting minutes from an April 2008 Harvard Task Force meeting. Nowhere does there seem to be any reporting of what the developers have promised and what they have actually done. The only information that I can find online describing Harvard's compliance with the Science Complex community benefits is this summary budget on Harvard's website. It doesn't give actual numbers but a "projection through March 31, 2009" and the categories of benefits it reports are so vague that the information is fairly useless. Harvard spent $1,617,767.66 on public realm improvements? The number suggests that Harvard is tracking this to the penny and probably has a detailed spreadsheet or database that breaks this number down into specific projects and improvements, but this detail is nowhere to be found in Harvard's report or anywhere else. The last time the Harvard Allston Task Force met (which I think was in January or February, but I'm not sure because there are no meeting minutes or evidence of the meeting on the BRA website) we asked the BRA for a detailed breakdown of what Harvard thinks it has done to comply with the Science Complex cooperation agreement. We were told by the BRA that its Compliance Officer has all this data and would get it to us, but that was at least 5 months ago and no information has arrived. Maybe it will appear at Wednesday's Task Force meeting. I found this card while doing some work around my house yesterday. 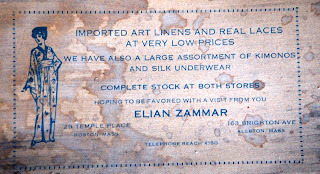 163 Brighton Ave is now the Kells bar, but several decades ago it was the place to go for art linens, real laces, kimonos, and silk underwear. An email announcing these emails was sent this afternoon, just before the holiday weekend. A bit more advance notice would be nice if City Hall actually wants people to be able to attend. Monday, July 6, 6:30 p.m. at the Honan-Allston Library: Reconstruction of North Harvard Street. Representatives from the Public Works Department and the Boston Water & Sewer Commission will be in attendance. Wednesday, July 8, 6:00 p.m. at the Honan-Allston Library: The Harvard-Allston Task Force will meet for an update on Library Park and other issues. WGBH's Greater Boston took a look last week at Harvard's layoffs, Harvard's Allston slowdown, Faust's low profile, and more. 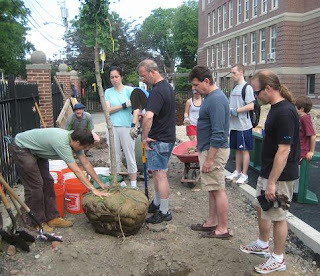 We will plant another Gingko tree at the Gardner School on Saturday, July 11 at 10am and continue our discussion about the other plants and landscape elements that will be part of this fun project. I hope you can join us to be part of this great community project. Thanks to the many neighbors of all ages who joined us last weekend. Also, thank you to Cicconi & Sons Construction Company for their assistance with removing the asphalt that used to be where the new trees are now. The BRA presentation has their ideas about phasing for the Holton St Corridor and the Charlesview presentation shows their current thinking. It is, according to a hedge fund manager quoted in Rich Harvard, Poor Harvard, an article by Nina Munk in the August issue of Vanity Fair.